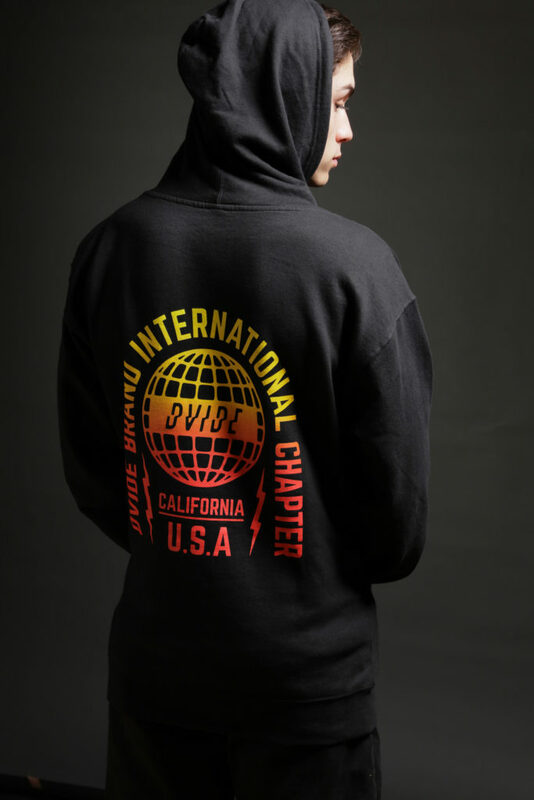 NEW – Dvide Spring Line has dropped and available online over at dvidebrand.com. Check out all of the NEW Snapback Hats, Beanies, Tees, Long-Sleeve Tees, Backpacks, Hoodies and Coffee Mugs. Shipping within the US only. Please email info@dvidebrand.com for International rates. 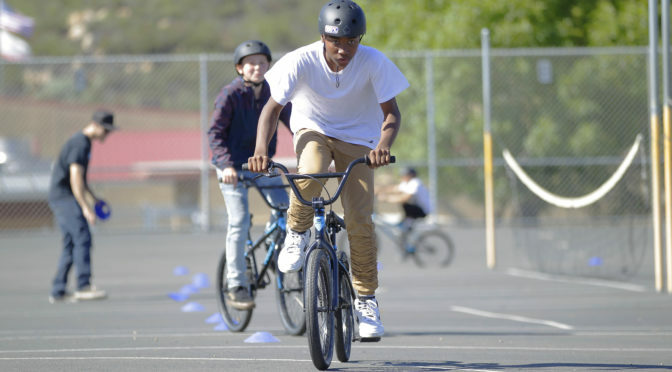 As we kick-off our 2019 Ride to End Obesity season, underwritten in large part by Barona Resort and Casino, we continue to celebrate our expansion and ultimately our ability to reach more young people with the positive message of staying active, eating well while introducing them to the sport BMX. 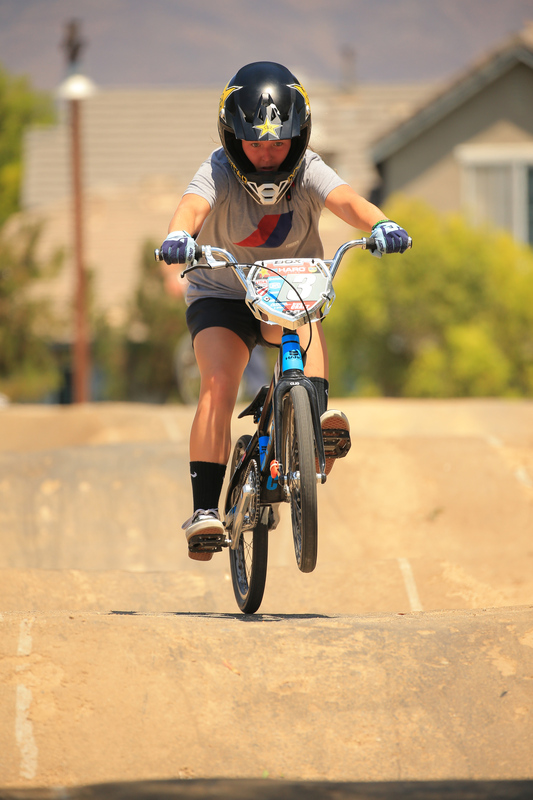 We are excited to continue our partnership with San Diego-based, HARO Bicycles. Haro has uniquely been a long-standing leader in the cycling industry while also investing a tremendous amount back into the sport and our local communities. This past weekend the team headed to Phoenix, Arizona for the Winter Nationals. Luckily, we missed out on the rain that had hit the race in previous years and we got to set up in the pits and had a good weekend of racing all-around for the team. Cam Mason flew out from South Carolina for his first race of 2019 and came in 3rd and 4th in Junior Men giving him a great start to the year. 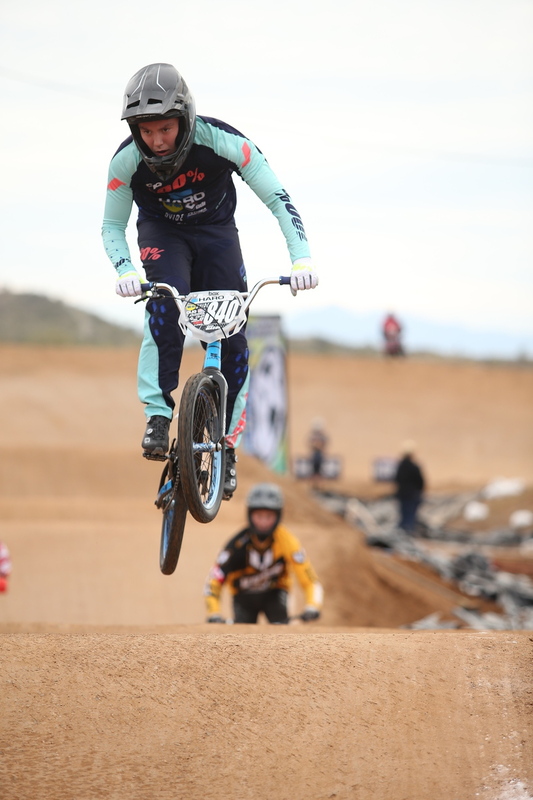 New to the team this season, Derin Merten put herself in the main event both days but unfortunately crashed out Sunday – still lots of positives moving forward to Albuquerque next month. 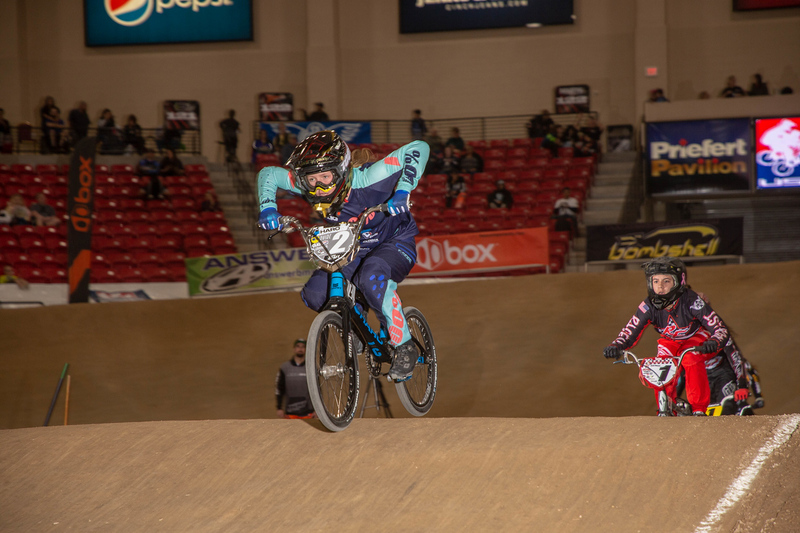 Madelynn DeSantis already has wins under her belt from Vegas last month and she continued hitting the podium with 2 wins, a second and third for her efforts in Phoenix. Brooke Craft started 2019 on fire with wins in Vegas, Oklahoma and another two this weekend in Phoenix. Brooke’s on a great track for the 2019 title chase. Solid weekend all-around for the team. Now that the dust has settled, reflecting back to the Grands and Winning the race and a National Number 1 Girl Title, how does it feel to put your name in the record books? It feels amazing! Winning the amateur title is one goal that I’ve always wanted to accomplish! Winning the national age group title is cool, but to win an award this huge and for my name to go into the record books alongside riders like Alise is an honor. How did you approach the main event? Anything different? For the main event I didn’t do anything different than I would usually do when I go up for a race. I knew I was up for the title, but honestly I forgot about it by the time I crossed the finish line and was just stoked I won (haha). For prep leading up to it, I just kept it fun. I had fun in the chutes and on the gate, and that’s what helped me win and stay relaxed in the end. I was absolutely amazed by the amount of people who congratulated me on the title, and especially all of the pros who came up to me. After the races, my family and I went to an Irish Pub for dinner where we celebrated. It meant a lot to receive congratulations from my competitors, friends, family, sponsors, frankly from lots of people I didn’t even know, and tons of riders who inspire me. We see you’ve been riding your park bike and some MTB in the off season. 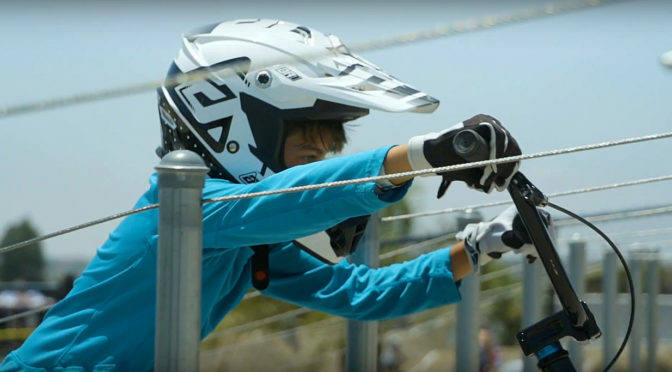 Do you think switching things up helps with your racing? I’ve been trying to ride at some indoor bike parks during the winter since no tracks are open near me because of the weather. I’ve ridden at Ray’s Indoor MTB Park in Cleveland, Ohio once and the Wheelmill in Pittsburgh, PA a few times this year. I’ve also done a few cross-country mountain bike rides with my Dad on the local trails. I think switching things up helps with my racing tons! Exposing myself to different kinds of cycling not only expands my skills but could also present me with new opportunities. Have you been checking out the Women’s Park events now that they’re in the Olympics? What are your thoughts on it? I haven’t really checked out the Women’s Park events too much. I think it would be super cool to branch out and try some of that stuff someday, though. But right now, racing takes up just about all of my schedule. Plus, I’m planning on competing in some extra events this year. Phoenix kicks off in a few weeks. How are you feeling after the off season? I’m feeling amazing! I’ve been training in the off season at the indoor bike parks and on the rollers. I haven’t gotten any track time in because of the snowy and freezing weather, but I’ll be out on the west coast a little bit before Phoenix, so I’ll get plenty of track time out there. At my house the highs have been below freezing all day and it’s either raining or snowing! I know you’ve been keeping your eye on the Red Bull Pump Track Series. Any plans on hitting it up this year? Awww, yeeaahhh! When I saw the Red Bull Pump Track Series last year it definitely caught my eye. I’m signed up to hit up one of the qualifiers this year so I’m super pumped to race that. I’ve been working on my pump-track skills at the indoor bike parks lately, and it’s so much fun! What’s the rest of the year looking like? For the 2019 season a big goal of mine is to go to Zolder, Belgium for the world championships and race the junior class there. I would love to travel to and race my first world cup too. As for nationals, the system is a little confusing but I was planning on racing quite a few junior races in the U.S. this year. I was also going to do a few other events like dual slaloms, the Red Bull Pump Track Series, and hit up some local trail jams. A huge thank you to my Mom and Dad, Coach Arielle, Jamie Staff, Dale Holmes, and my sponsors (Haro, Cliq, Dale Holmes Racing, 100%, WD40, 3dyn Composites Inc, Dvide, ODI, Gaerne, Box, Tioga, HRP Designs, EVS Sports) for supporting the dream! See everyone in Phoenix! As we kick-off 2019, we’ve changed gears a bit on the team front, Haro will now be our primary sponsor. 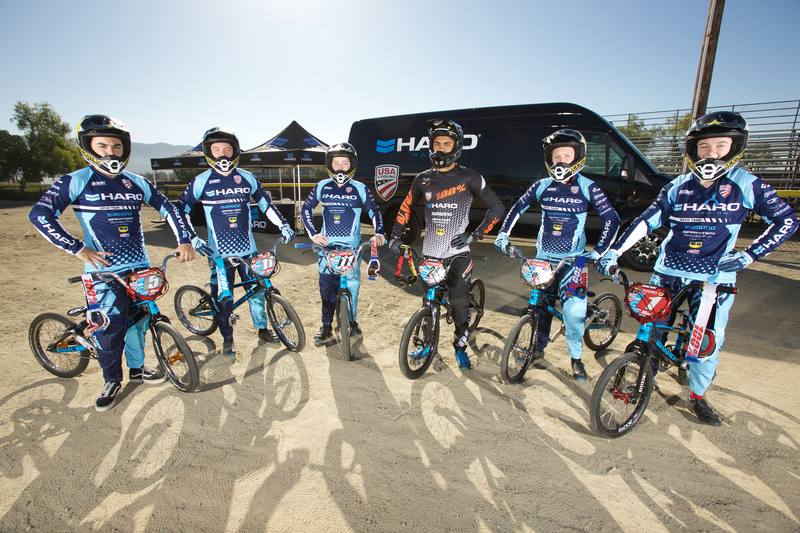 The goal is to now rebuild the next Haro Factory Team over the next few years. Big thanks to everyone supporting this new effort and we look forward to a good year and to continue building on this program. 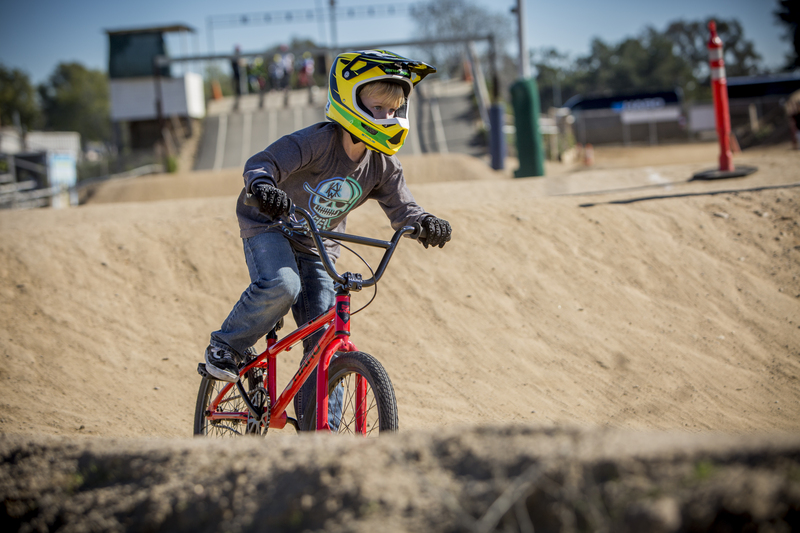 Our BMX Pro For A Week Summer Camp has had such an incredible response that we’ve decided to run one week of Holiday Camp from Monday, December 31, 2018, to Friday, January 4, 2019. You may sign up through the Mission Valley YMCA at (619) 298-3576 for a full-week, or for a one day adventure through the Scripps Ranch Swim and Racquet Club at (858) 549-5355. You may also sign up directly with us at DaleHolmes99@gmail.com but you will need your own transportation to and pick from the track, 10:00am and 2:00pm daily. Fees are $50 per day or $190 for the week. Fees include bike rental, helmets and gloves, track fees, and MANY giveaways. 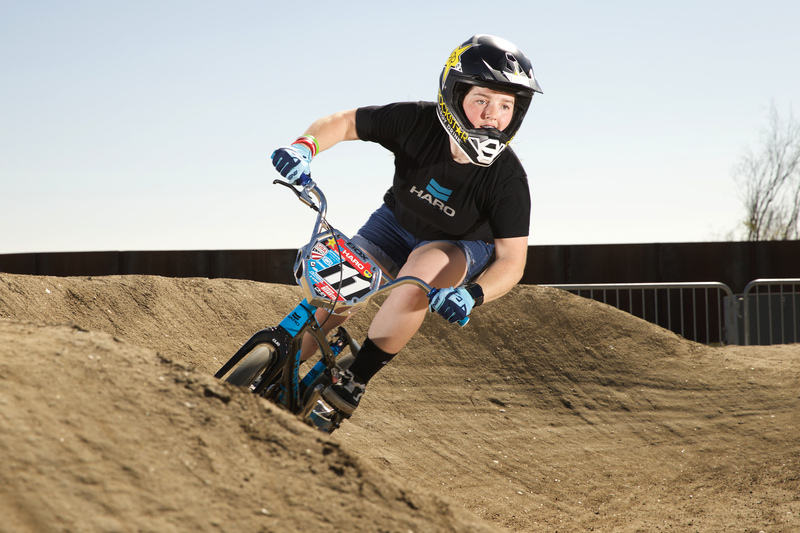 Please let us know if you have any questions and we sure hope to welcome your young BMXer back for Holiday Camp! Please contact us at DaleHolmes99@gmail.com. This would make a wonderful Holiday present for your youngster too! Limited to the first 50 sign-ups. Camp will be held at Kearny Moto Park. 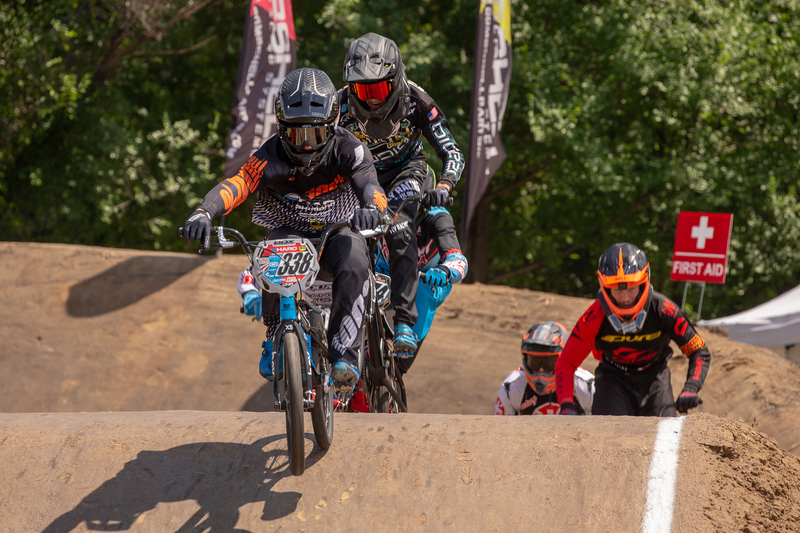 Great season ending for the team at the USA BMX Grand Nationals over the weekend in Tulsa, Oklahoma with Cam Mason, Payton Ridenour, Brooke Craft & Maddie DeSantis all finishing the year strong at the last and most notable race of the season. Maddie DeSantis started out winning the Friday night Race of Champions then backed it up winning Cruiser and the National number 1 plate for the year on Sunday. Brooke Craft had another solid showing placing 2nd and number 2 for the year one up from last year where she finished 3rd. Cam Mason didn’t have the greatest weekend but still put it in the main event in Open and walked away with plenty of motivation for the winter. 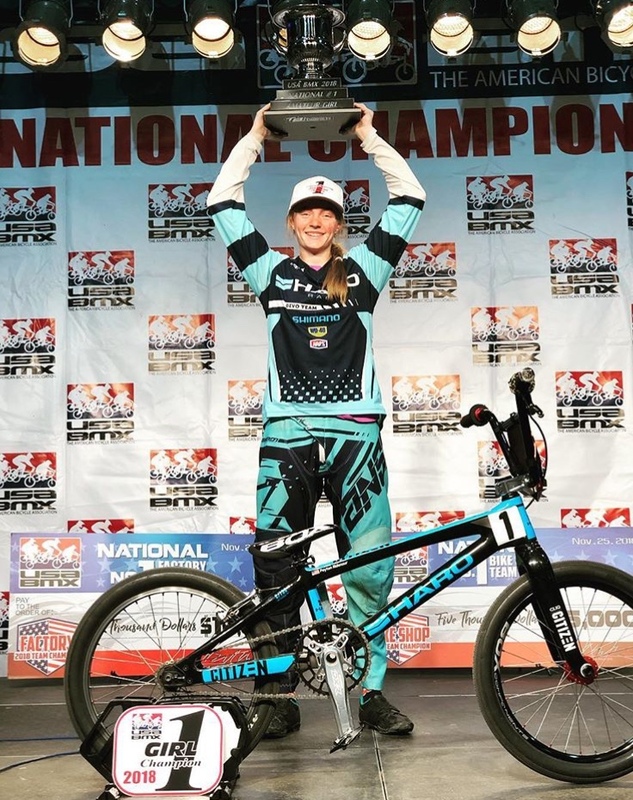 Payton Ridenour had the weekend of her career winning the Grand Nationals on Sunday and with that, also taking home the Cup for National Number 1 Girl and her name going down in the record books. A great way to finish off the year. As we head into the off-season we want to thank all of the team sponsors for their continued support through the 2018 season. 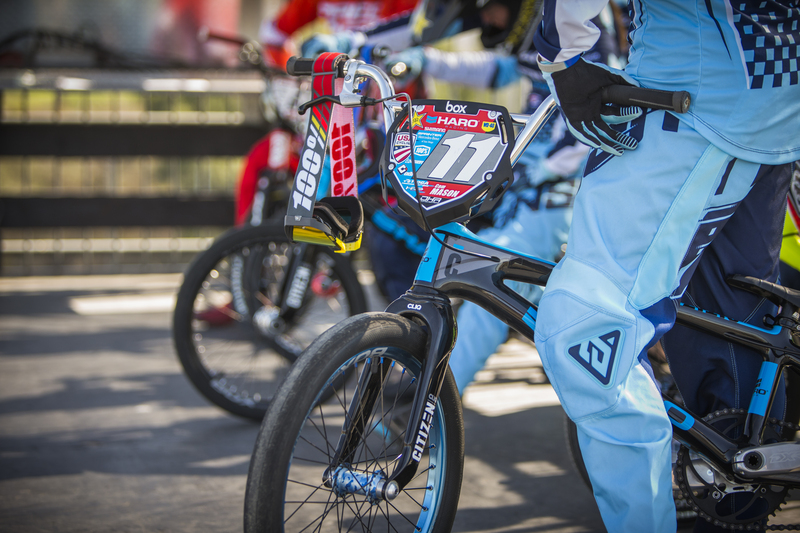 USA Cycling, Haro Bikes, Rockstar Energy, WD-40, Dale Holmes Racing, 100 Percent, Answer MX, Shimano, ODI grips, BOX Components, Dvide, Tioga Tires, HRP Designs, Wheel Builder. 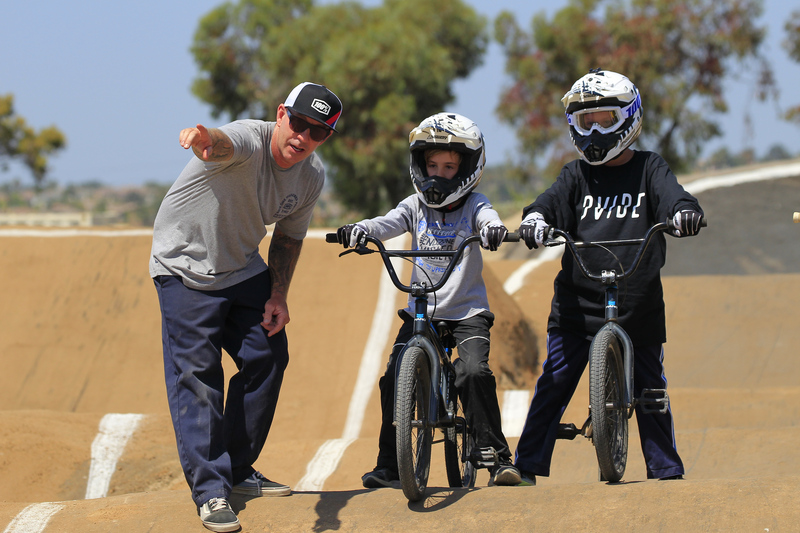 During our BMX Pro For A Week Summer Camp season, two of our good friends from the UK, Bill Barrowcliff and his son, James (from Trophy Specials), donate an annual award to one of our campers. 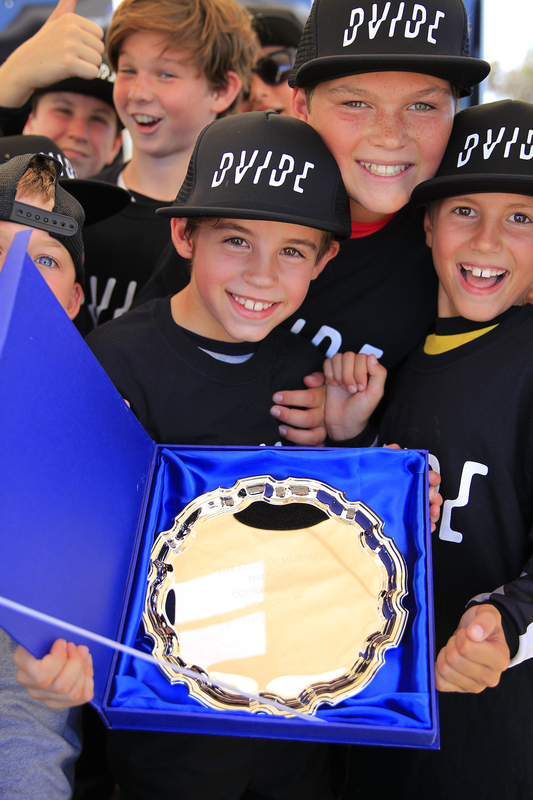 The award is coined the Stephen Murray BMX Courage Award. Bill was one of the UK’s official starters in the 90s and James regularly battled with Stephen in their age group for many years. Through social media Bill and James have been able to connect with racing again and follow Stephen’s journey since his injury. Big thanks to Bill and James. We also got to plug in Dvide tees and hats for the last few weeks of camps and dial the kids in with some free swag and get this new project rolling. 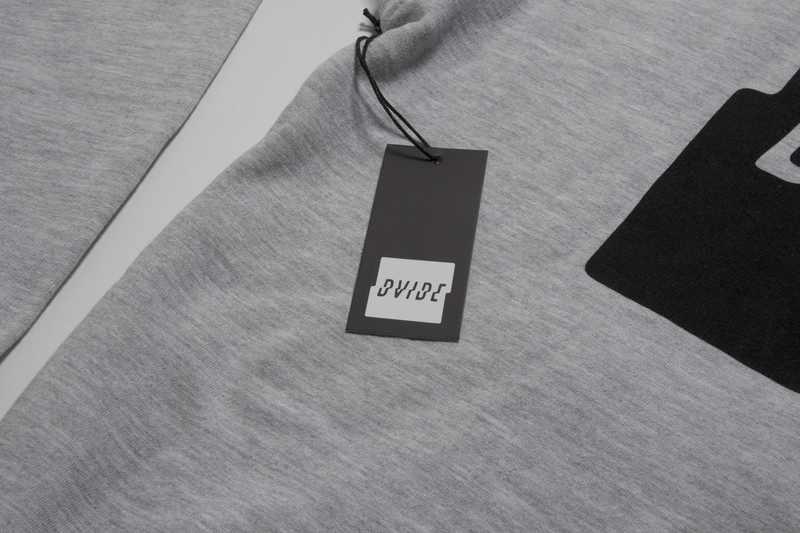 I wanted to challenge myself and try something different so I decided to do a little apparel line project called Dvide. Big shout out to Mark Ward for helping with logo and branding concept, Michelle La Greca and Bob Haro for sourcing apparel and to my good friend, Lewis for setting up the Shopify page and all his help. Please check it out. Good to see Cam Mason back from injury after sustaining a broken wrist a few months ago in San Diego. Cam eased back into the race groove winning the Charlotte North Carolina State race this past weekend. Next up, Cam heads down to Sarasota, Florida for the Sunshine State Nationals and then finishes up the year in Tulsa for the Grands with the rest of the team. 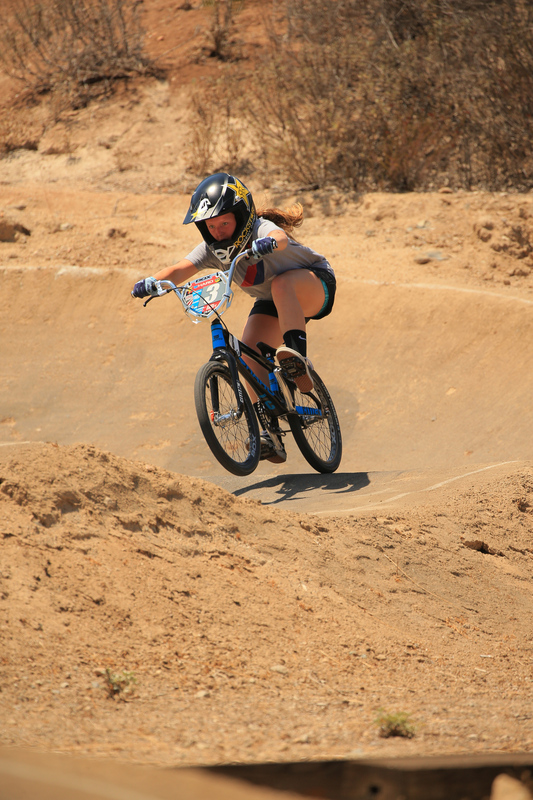 I am lucky enough to call 3 tracks my home track, which are Cactus Park, Kearny Moto Park and Chula Vista BMX. 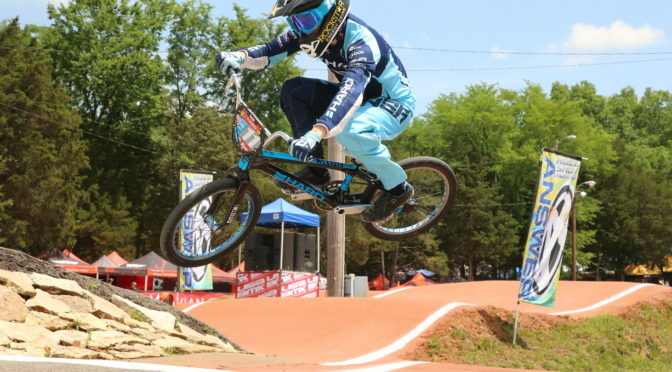 USA Cycling, Haro Bikes, Dale Holmes Racing, Rockstar Energy, WD-40, 100 Percent, Answer MX, Shimano, ODI grips, BOX Components, Tioga Tires, HRP Designs, Wheel Builder. Don’t forget my parents and entire family! I owe a big thank you to all my sponsors!!!! I am fortunate enough to have won myself many titles over my past years of racing, I hold the following titles: 6x State Champion, 2x Redline Cup Champion, 3x Gold Cup Champion, 4x California State Games Champion, 3x Western Division Champion, 3x ROC Champion, 2017 World #7 and 2015 NAG 1 title! As for major wins in my racing career so far, I would have to say winning NAG 1 in 2015 was a big accomplishment for myself but I think my must memorable and most exciting moment in racing has been when I went to my first worlds race in 2017, competed against over 50 girls in the world and was able to take home a World #7 title. May not have been a WIN but in my mind it was a WIN!!! Well… my season has not gone the way I have planned, however, I have learned a lot and I am continuing to make progress, working hard on and off the bike. I have had to make some adjustments to my racing program in order to compete with my competition. 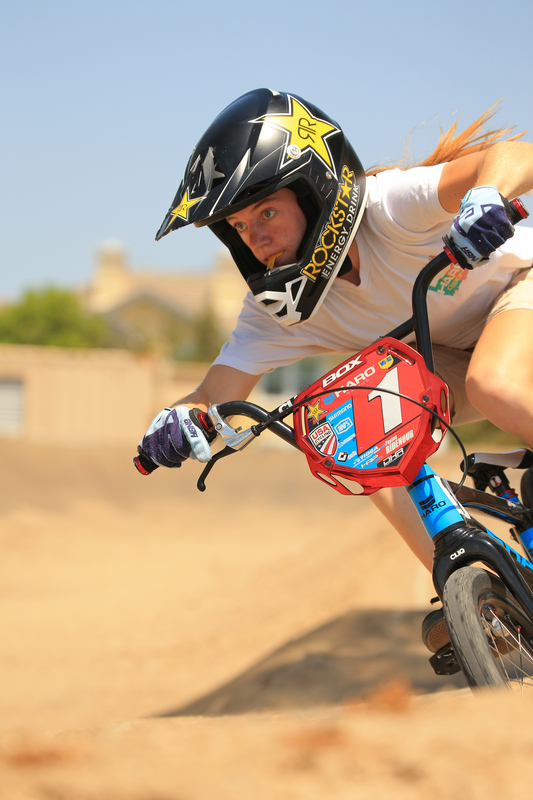 I race against some of the fastest girls in BMX right now. I have been able to bring home a couple wins and many podium finishes this season. I am proud of myself for continuing to get the finishes I have had with such hard competition and it is only getting harder each race but I am up for the challenge. These challenges only make me a better racer. 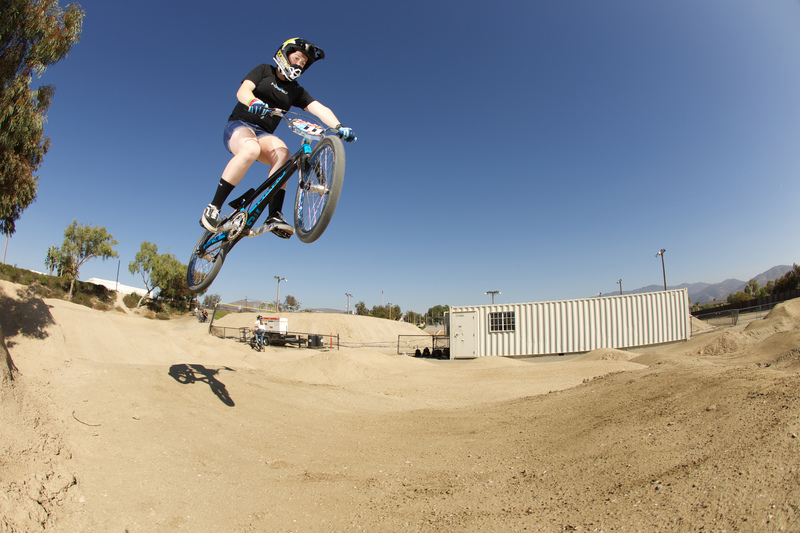 You’ve been easing into some SX riding down at Chula Vista how’s the Big Hill riding going? I absolutely love riding the SX track at Chula Vista and feel I am the perfect fit for this type of track. 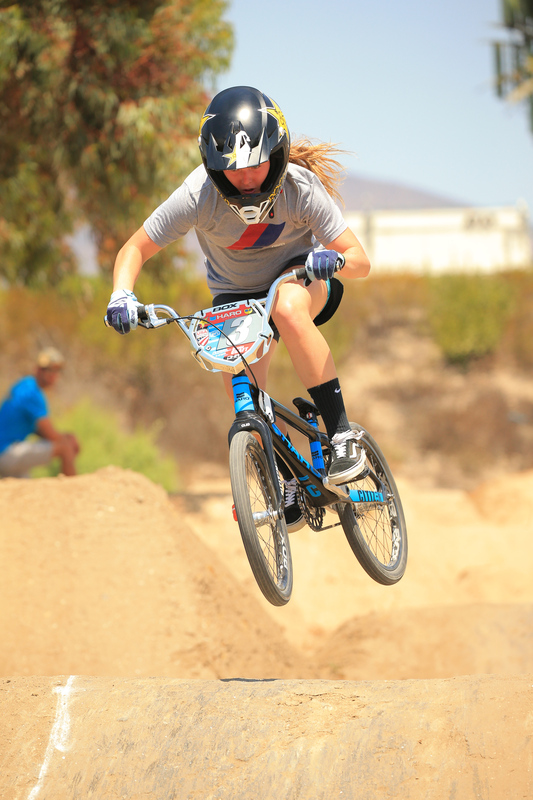 I have eased into the SX track over the past 8 months and have been able to attend 3 super cross training camps down at Chula Vista Elite Athlete Training Center. I have definitely stepped out of my comfort zone this year and I am now jumping massive jumps and I am learning how to better communicate with my coaching staff, trainers and teammates on making myself a better SX racer. I kind of feel like a pro when I am at the top of the SX hill. I love it!!!! How’s the local San Diego scene? Do you ride the trails and pump tracks for fun? 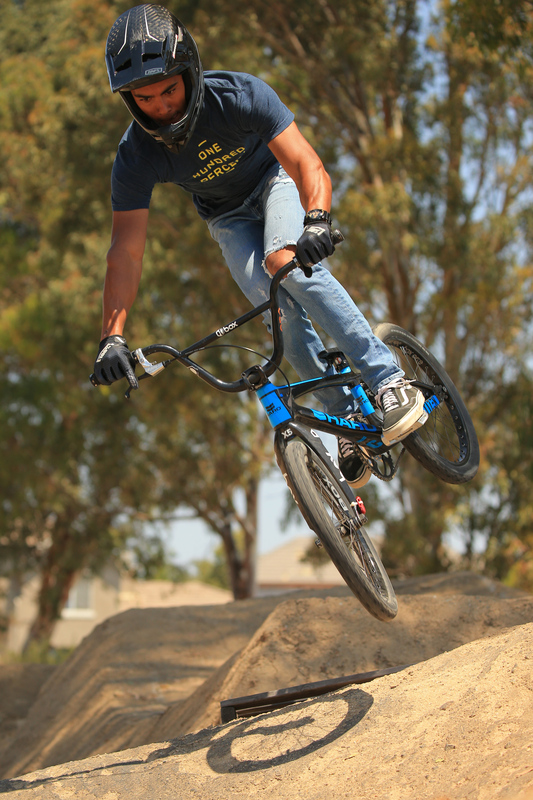 The local scene in San Diego is absolutely amazing, we have prefect weather almost year round, which allows for year round training in BMX. Of course, I ride trails and pump tracks. I do ride for fun, it is so important to always make time for fun while riding. Trails and pump tracks I feel help me better my skills on and off the BMX track. I look up to many riders in this sport. If I have to pick my first pick would be Alise Willoughby of course she is a powerhouse of a girl racer which is what I am going to be. 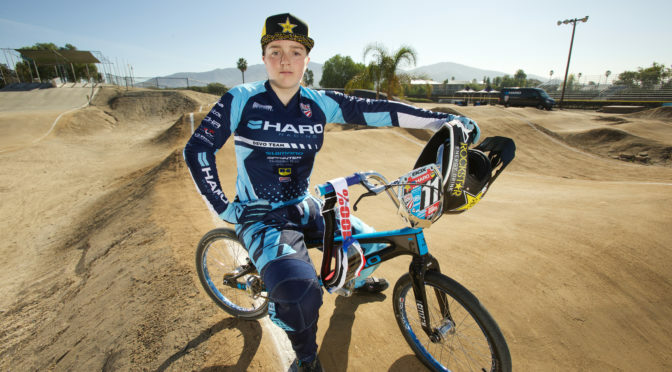 Lauren Reynolds is awesome, I get to see her ride and train weekly which motivates me to be a better rider. 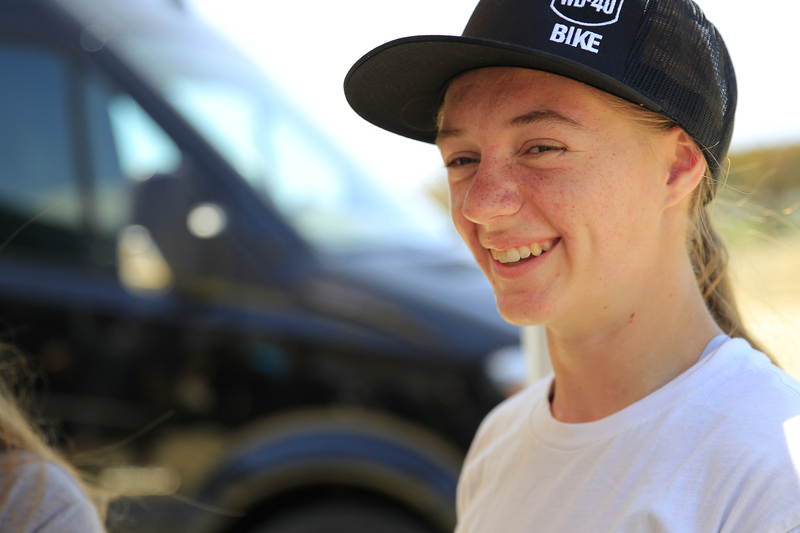 My next pick is a girl pro who has been out of BMX for while now do to a injury, Caroline Buchanan… I have followed Caroline’s road to recovery over the past months, her determination both mentally and physically to get stronger has made me want to work harder and has shown me being mentally tough is a major part of this BMX sport. Wait… I have a couple boys I look up to, Nic Long, has to be one of my most favorite pros he keeps me laughing, never lets me get down on myself and always is pushing me to work harder and harder. I have the privilege of being able to ride and do gates with him at his home, he is a fan of mine (hahahaha). Walker Finch, teammate of mine for 6 years, taught me how to smile and keep positive with his great teeth and hair (haha). My list is so long with riders I look up to, a lot of riders have made a big impact on my BMX career. Everything… Being able to travel and see places I would of never have seen without this sport. I have experience and have seen more in these past 8 years then most in a lifetime. I want to finish strong and continue to get better and better each day. I am going to continue to work hard to get that NAG 1 title back in the 14 girls class and of course I really want to race the NAG 5 challenge for the first time at the Grands this season. My longterm goal is to first turn pro at the age of 17 years old and I want to ride for Team USA in the 2024 Olympics. I am going to keep grinding! Our crew have just finished up a few weeks on the road hitting up the Great Salt Lake Nationals in Utah before heading down to Chula Vista Training Center (formally known as the OTC) for a Camp with all of the Team USA riders and staff. Race-wise in Utah we had some good results with wins from Maddie DeSantis, Brooke Craft and Kamren Larsen. Down in Chula Vista, the riders got a chance to session both the Rio and Beijing SX tracks and also take full-advantage of riding the regular track, pump tracks and squeezing in a few photo shoots. 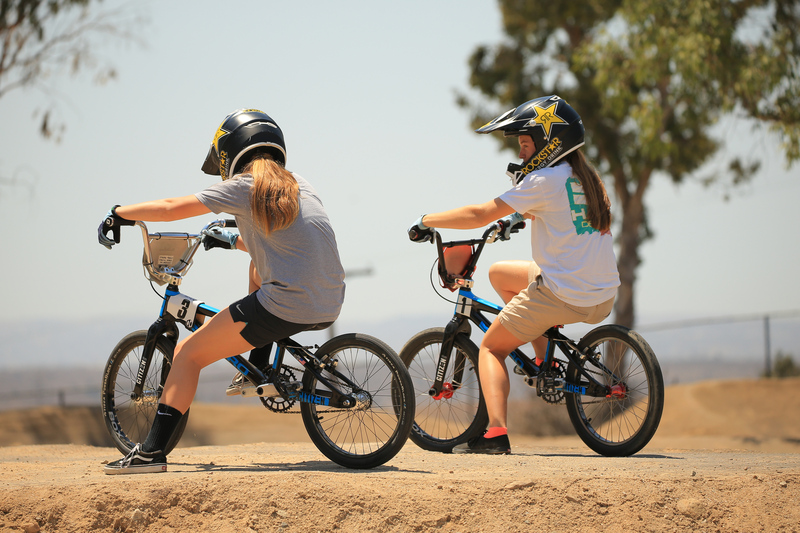 If that was not busy enough both Brooke Craft and Payton Ridenour spent some time hanging out and helping with the kids during one of our BMX Pro For A Week YMCA Summer Camps, which was pretty cool and the campers were ecstatic to meet the girls. Unfortunately, Cam Mason crashed out during the week’s camp with a wrist injury but we know he will be back in no time. Healing vibes, Cam. Back on the gate post-injury Kamren Larsen put himself in the Elite Main Friday over in Minnesota and just dipped out doing it again Saturday with a mishap in the semi but still a good start for the remainder of the season. Brooke Craft was also in Minnesota getting on the podium all 3 days. Next up, the the team will be out in Salt Lake in a few weeks time for the Great Salt Lake Nationals. Justin Kosman just shot our newest BMX Pro For A Week YMCA Summer Camp Edit. We’re excited to have another stacked season as we head into year #4. Ride to End Obesity partnered with the Toby Wells YMCA yesterday in an effort to share the message of leading a healthful life and the importance of staying active. The Toby Wells YMCA serves many communities in San Diego County and one specifically, are military households. RTEO had the opportunity to host one of our Ride to End Obesity School visits at Hancock Elementary, a local school in Tierrasanta with 100% of its children from military households. And, at any given time 50% or more of these kids have a parent on deployment. 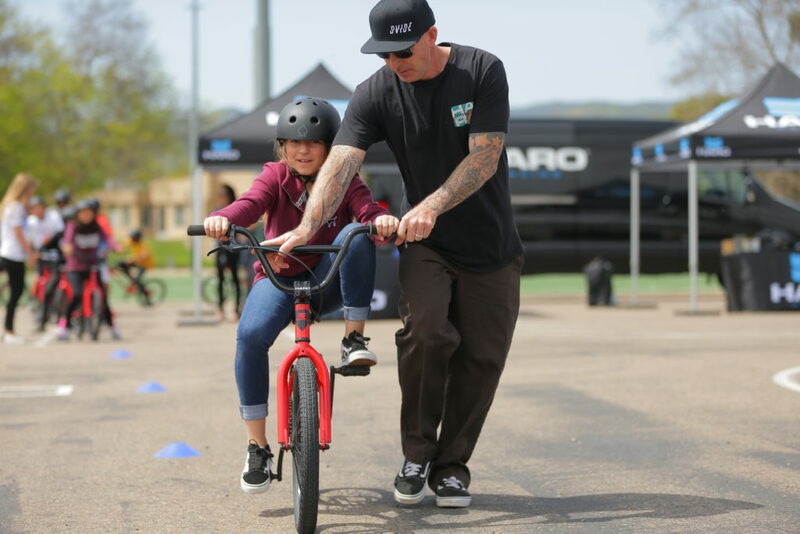 To help raise their spirits and awareness of both BMX and being healthy, RTEO brought in the crew, Jason Richardson, Rylinde Cole, Adrienne Wells Holmes, Brooke Craft, Tommy Craft, Dale Holmes and Justin Kosman to shoot some footage. 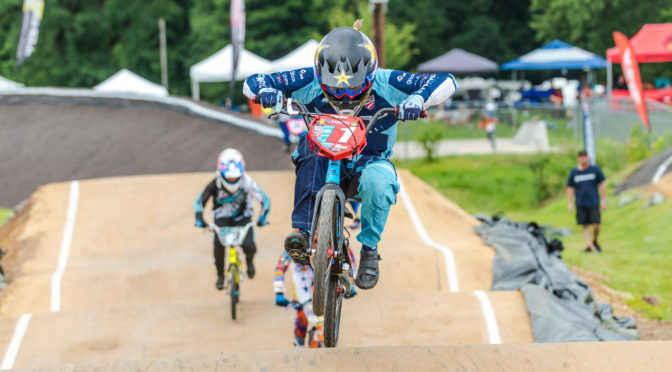 Music City BMX was rockin’ this past Memorial Day weekend (May 25-27) in Nashville, TN, for the latest stop on the USA BMX national schedule. The facility and track were in prime condition as always. As for the weather, it was HOT, HOT, HOT, but so were all the racing action. 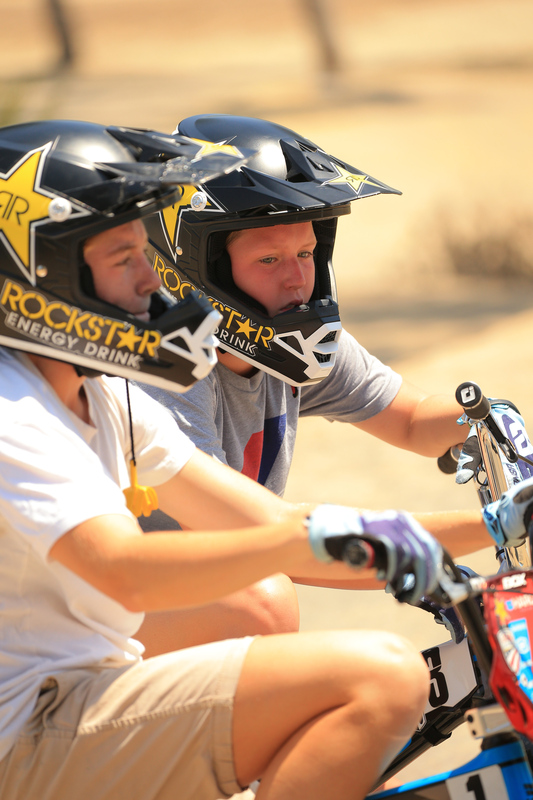 Payton “P-Nut” Ridenour was running hot laps all 3 days in the highly competitive 15-16 Girls class. Not losing a lap all weekend, she dominated the class and added three more wins to the books. Cam Mason put in some rippin’ laps all weekend in the 16X class and could be seen boosting the triple into the second turn. He finished up with a 7th on Saturday and a 5th on Sunday. The summer race season is starting to heat up. 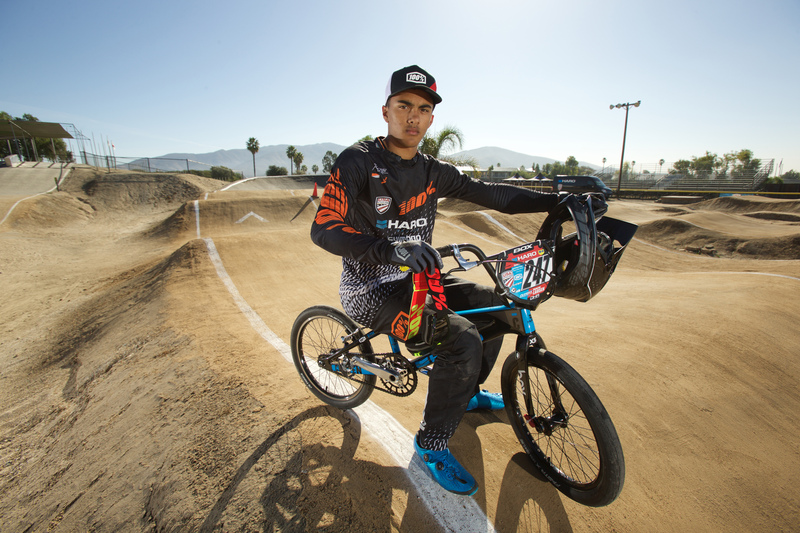 Look for the Haro / U.S. Development Team to be representing at more stops along the national circuit.